Happy Friday, ladies! The star of this week's handbag chit chat is this Michael Kors Greenwich bucket bag. I am going to be honest and tell you that I am not a fan of the brand in general. The only item I own from Michael Kors is this watch (which I love and wear every single day). I have no particular reason as why I am not fond of the brand. However, I walked into Nordstrom a few weeks ago and completely fell in love with this bucket bag. What caught my attention is the beautiful maroon shade. The color is versatile, still neutral but not at all boring. They saw the burgundy and olive green versions on display. Both are equally beautiful. I had a hard time deciding between the 2 colors but ultimately, went with the burgundy version. Little did I know, the bag is available in 7 (seven!) colors ranging from black to white. Being a huge fan of textured leather, this saffiano leather bag is right up my alley. As mentioned above, this is my first ever handbag from Michael Kors and I am impressed. The leather is very durable, sturdy and extremely carefree. 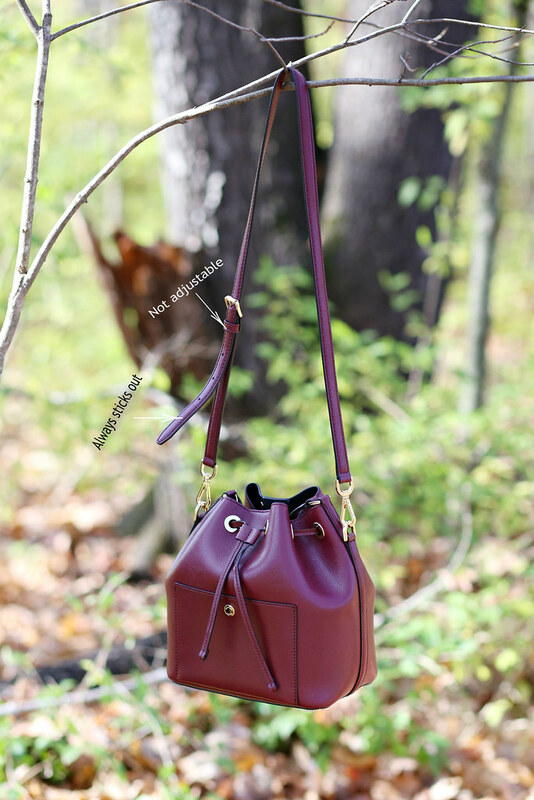 I love the contrast between the burgundy color and the gold hardware. The bag itself is roomy enough for toting around your everyday essentials. The size of the bag is just right for my 5'2" frame. The shoulder strap is adjustable and removable. I wear it on the last hole and the bag hits right at my hip. It also comes with a top carry handle. Interior has one slip pocket (which does fit my iPhone 6 plus). Since I don't really care for the logo, I did remove the luggage tag. My only complaint is the loop that holds the strap does not go up and down. Therefore, the excess strap always sticks out (see the first photo). Hope it will lay flat over time. I wouldn't want to pay a lot for something trendy like a bucket bag. For a 100% genuine leather handbag, I think the price is fair. 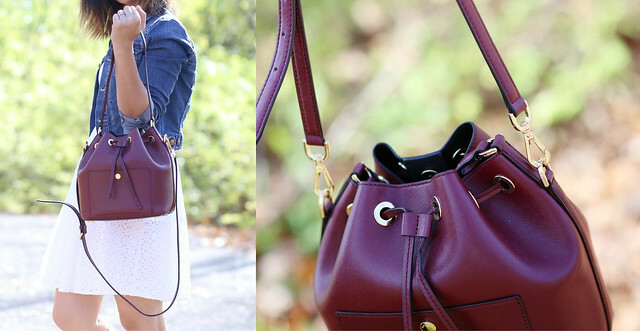 This bag is a wonderful addition to my Fall wardrobe. All in all, I love this bag and highly recommend it to anyone. The bag looks like a great size and I love the color! 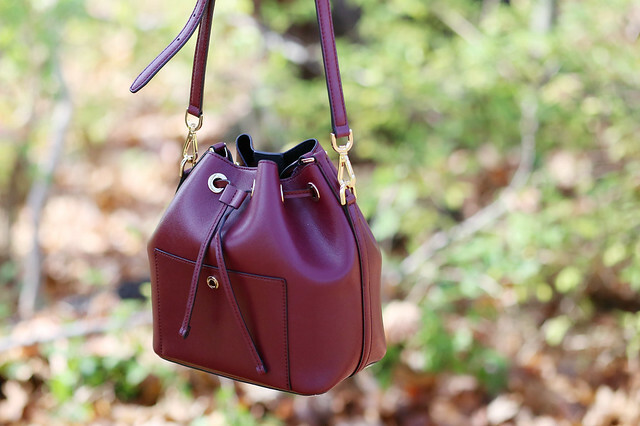 I LOVE the plum/wine shade of this bag! So perfect for fall! Loved reading your review! The bag is cute but I was actually drawn to your boots. If you don't mind, where are they from? Hi Sydney! I really love the color and I agree saffiano leather is so great! Excited to see you incorporate this into your fall lookbook! That is a nice bag, shame the strap pokes out and annoys you so much though! I have a couple of michael kors bags with this concern. And The thing that I do is attach the strap with a small clear rubber hair tie, with one or two turns.